The Watercone® is a solar powered water desalinator that takes salt or brackish water and distills it into freshwater. It is simple to use, lightweight and mobile. Designed to produce 1.5 liters a day, it provides a child's daily needs for fresh water and reduces the number of children who die as a result of drinking unsafe water, currently estimated to be 5000 or more each and every day. The WATERCONE® is a long lasting UV resistant Poly Carbonate product and can be used up to 5 years daily. The material is non-toxic, non-flammable and 100% recyclable. The black pan for the saltwater is already made out of 100% recycled PC. Even when the WATERCONE® becomes old and tarnished, it can still be used to collect rain water, as a roof panel or container for other goods. Single products are not available at the moment! 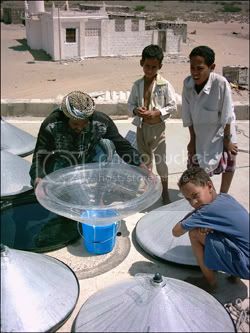 The Watercone® was tested in Yemen in 2004 and in the Lake Baikal region of Russia in 2005. Thanks to Ecogeek for bringing this design to my attention. Until everybody who needs one can get a Watercone®, you can pasteurize water in clear plastic bottles by exposing them to the sun. The Solar Water Disinfection (SODIS) process is a simple technology used to improve the microbiological quality of drinking water. SODIS uses solar radiation to destroy pathogenic microorganisms which cause water borne diseases. SODIS is ideal to treat small quantities of water. Contaminated water is filled into transparent plastic bottles and exposed to full sunlight for six hours. Sunlight is treating the contaminated water through two synergetic mechanisms: Radiation in the spectrum of UV-A (wavelength 320-400nm) and increased water temperature. If the water temperatures raises above 50°C, the disinfection process is three times faster. You can raise the temperature of the water in transparent bottles by putting them in the sun against a dark background. 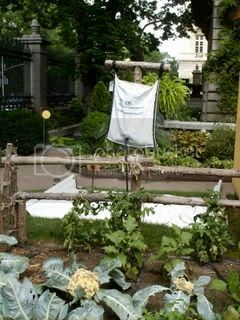 As suggested above, years from now, when your Watercone® wears out, you can use it to collect rainwater for the gravity drip irrigation system exhibited at the recent Design for the Other 90% show at NYC's Cooper-Hewitt Museum. There are lots of other things you can do with sunlight and plastic containers. I plant my garden a month or six weeks early by practicing Recycled Solar. 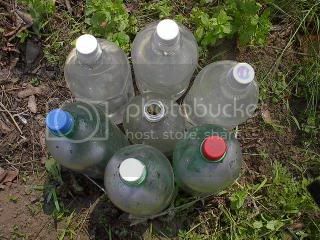 Place a ring of plastic bottles on the soil, fill them with water, plant seeds of your choice (I've grown tomatoes, peppers, zucchini, cucumbers, beans, and greens with this technique) in the middle, and cap it with another bottle with its bottom cut out. This makes a solar heated coldframe or cloche.